It may have taken a while but it seems that You Me At Six have finally come of age. Over the course of their last three studio albums they’ve gradually matured and if Cavalier Youth is the final push towards fully fledged alternative-rock stars then they’ve nailed it. It may not carry the charm or wit of Take Off Your Colours but their fourth studio album seems like a huge step up in terms of musicianship and it makes for a rewarding release. 2011’s Sinners Never Sleep showed sparks of the same sort of promise, but Cavalier Youth is much more consistent in its maturity. 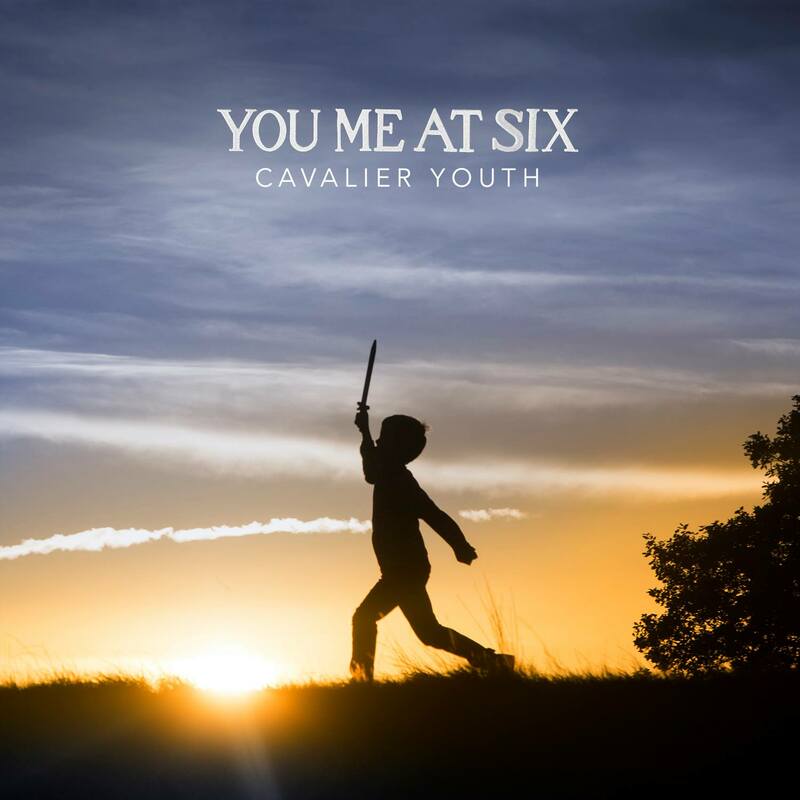 As its name suggests though, Cavalier Youth is still You Me At Six brimming with a youthful energy and passion, but that energy seems much more focused and as a result the band sound much more driven. The name of the first track may suggest otherwise but ‘Too Young To Feel This Old’ is an exuberant opener that sets the bar surprisingly high. Vocalist Josh Franceschi sounds more confident than ever as he shifts from subtler vocals to belting the chorus, and the other members of the band give just as much. Following track and single ‘Lived A Lie’ sounds just a huge, despite displaying a slight relapse. The second track packs a big chorus and fills it with hooks aplenty, but it doesn’t sound as fresh in a sense, but maybe that’s just because I’ve heard it every time I’ve booted up FIFA 14 over the last few months (which has been often). From here onwards the tracks venture into darker territory – or at least dark by You Me At Six standards. Second single ‘Fresh Start Fever’ carries shades of ‘Thnks Fr Th Mmrs’ (Fall Out Boy) and it’s a welcome move into a sound that You Me At Six have seemed wary of in the past, and sixth track ’Win Some, Lose Some’ continues the theme by taking the ‘heavier’ elements of Sinners Never Sleep and blending them with mildly aggressive vocals to match, most so in the chorus. Cavalier Youth is an album packed with explosive choruses like these and most of them benefit from a bit more bite, especially on this track, which begins quite mellow and then cranks it up several gears before managing to somehow step it up even more when said chorus kicks in. It means that Cavalier Youth is definitely a departure for the band but it’s also one that makes them much more credible as artists. Despite carrying a bit more of an edge there’s still the uplifting tracks that You Me At Six do so well, most notably on final two tracks ‘Carpe Diem’ and ‘Wild Ones’, the former of which is as positive as its name suggests, translating to seize the day – which the band do by combining upbeat vocals with fast paced melodic instrumentals. ‘Wild Ones’ is a more traditional and expansive closer, building slowly layer by layer from chiming guitars and relaxed drumming into an emphatic array of sounds that capture the Surrey band at their euphoric best. Cavalier Youth peaks just as it ends, which is a shame, but taken as a whole it takes in a variety of sounds and styles, sandwiching some of the more brooding tracks between up-tempo chunks of pop-rock sunshine. The more relaxed ‘Cold Night’ slows it all down in favour of a more sentimental approach with a contagious chorus, and ends up as the one of the albums best. Quirky tenth track ‘Be Who You Are’ seems oddly out of place but remains delightful nonetheless as Franceschi croons over stripped back instrumentals whilst namedropping Joy Division as part of a fairly romantic and nostalgic change in tempo. Cavalier Youth’s lyrics are much more developed, ditching angsty one-liners for more mature themes and outlooks and the instrumentals are also much more varied, with guitars ranging from chunky riffs to fuzzy backdrops (‘Win Some, Lose Some’), whilst Dan Flint gives his best recorded performance to date on drums. It all comes together brilliantly on ‘Love Me Like You Used To’, which seems like a culmination of all the bands work to date, and if there’s one track to listen to on Cavalier Youth it’s this one. Its stadium sized chorus, climbing vocals and dynamic instrumentals make for one of the bands best songs to date, and the track stands as a firm highlight of one of their best records to date. There’s less of a reliance on pop-punk stereotypes and You Me At Six sway more towards carving out their own sound on their fourth studio album. The style that they find suits them incredibly well, and it serves as a testament to how far they’ve come. It’s not quite a transformation of Deaf Havana standards but Cavalier Youth is much more Old Souls than it is Coming Home, although ‘Cold Night’ does come across reminiscent of ‘It’s Not Your Fault’. Considering the band were never going to return to the sound they started with, Cavalier Youth seems like the next natural step in the bands evolution and it’s one they’ve pulled off very well. In expanding their sound and honing their abilities they’ve started to shed the sound that’s defined them as teen heartthrobs and moved onwards to bigger and better things without losing too much of what made them appealing in the first place. Bravo.